After a long day, the thought of cooking dinner and cleaning up the kitchen can be daunting. The Keizer Chamber of Commerce is here to help. A new initiative aims to support both home cooks and local restaurants. 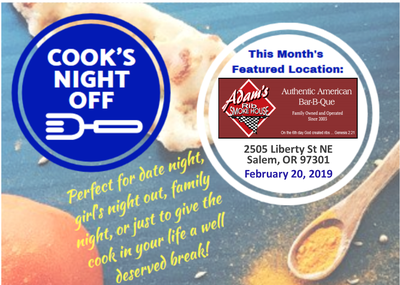 The chamber calls it “Cook’s Night Off.” By participating, you could win a $100 restaurant gift card. Spread the word! Share the facebook event with your community and encourage others to join in. Cook's Night Off @ Adam's Rib Smokehouse! Here is a link to their menu!